What can be said about Armcannon that I haven't already tried to hammer into everyone's heads pretty much incessantly? 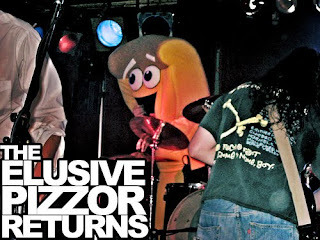 A band that can be taken seriously as musicians and yet light hearted fun as performers (like the drummer playing in a Pizzor costume) at the same time, a group who has pushed the boundaries of VG rock with their high production quality, amazing arrangements and incredible performances. 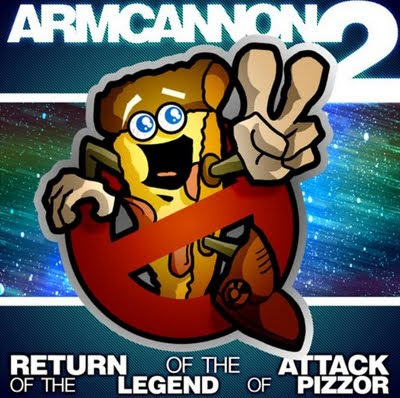 Their newest album Armcannon 2: The Return of the Attack of the Legend of Pizzor is their sophomore release after their debut work Leg Vacuum, which I also highly recommend. As with the last release from this band, I feel more than a little compelled to tell you just why I believe this album is so impressive. The album kicks off with Power Rangers, which is just what you can imagine, but with the addition of double bass pedals and heavier guitars they take the song to another level. Unlike the mostly non vocal tracks of he first album, this one kicks right off with a cheesy but fun impersonation of Rita Repulsa. Along with the drums and guitar, the song kicks into high gear with more guitars, keyboard and of course the vocals that roll right along with the original song. The song starts hard, ends hard, and just rocks. The upbeat nostalgic tune kicks the album off in just the right way for all the other late 80s / early 90s classics to come. Speaking of which, from classic shows from our youth we head right into one of the classic games of the same era with an amazing rendition of the Castle Theme from Super Mario World. The song kicks off with the familiar and ominous boss fighting tones you remember. This leads into some deep bass to add more tension, along with amazing piano work that fits the game perfectly. That's when the guitar comes in to set a darker tone, and along with a maniacal laugh really sets the song off. The keyboards are the stand out instrument on this track, with the other instruments providing amazing back up and fill at the beginning of the song. This song is truly a showcase for the amazing keyboard work from Armcannon. About halfway through the song the keyboard drops off a bit to let the darker tones of the level take over and build into a great little fill where each instrument takes a round robin turn at a riff of the song. From here the music swells into a lush chant which builds and builds until it is killed off in the end of the song. From here we take a few steps back in time to the cheery overworld sounds of Super Mario Bros 2. The instruments kick off with the recognizable and upbeat tune from the Mario Bros 2 overworld. With a danceable drum and bass section and the piano and guitars wrapping around one another in that familiar sound. The guitar give off an extremely catchy surf sound which brings the mood down a bit to a jazzy piano bit which leads into some fine guitar work on a nice solo along with some honky tonk style jazz piano. The overworld theme dies out to take us to a slower and grimier underground tune which collects some grittier guitar work along with some synthed up keyboards. The underground theme takes some liberty from the original piece at points which works really well, and builds into a baseball field style organ fronted character select song. At first with just the drums and keyboard taking a role upfront, and as the keyboard starts to do it's own thing the guitar takes over and they both get a chance to do their own thing before it closes out on the same upbeat feel we started out on. Mega Man 2 Wily was the first leaked song from the new album, and has been one I have had on repeat for some time now. The song kicks off with a bang, using the guitar and drums to create that very familiar theme from Mega Man 2, and only proceeds to get more metal from there. Soon all the instruments kick in with a wall of sound, with guitars wailing and the drums and bass pounding. "I'll get you Mega Man!" Wily declares as we bust into a series of incredible guitar solos which give this 1989 released NES game the over the top metal sound it deserves. We break back into our regularly scheduled song now and partake in a small piano piece which leads into ever more amazing guitar work until we start bringing this song to a close the some metal way it started. Now our nostalgia trip through time lands us in front of our TV, this time without our controller, to watch some people put the hurt on in real life (well sort of). We have here a medley of the WWF themes to Hulk Hogan & Shawn Michaels. We kick off with a dark mood, with the vocals of the Hulk Hogan theme seemingly chanted before the music kicks in. The song definitely has a bit of a cheesy metal sound but with certain additions and flourishes sets the song apart and remains ridiculously catchy, even for those (like me) who barely remember the original songs. The vocals are of course thoroughly manly and the center of this song. the drums seem to be working overtime as well, with the guitars, keyboard, and bass adding plenty of gusto to the levels of tough to this song. At about two minutes in we get our requisite and exquisite wailing guitar solo. This brings the vocals back on with some great backup singing as well, and the sound of one ecstatic woman transitions this medley seamlessly into the much different but equally manly themes of the Shawn Michaels theme. Just as with the Hulk Hogan theme, the fun and cheesiness of the vocals is on full display and tough to get out of your head. (I actually sang this song a few times at work to be honest). The medley continues on the same path of 1980's hair metal with the keyboard and guitar flourishes creating the perfect mood. the awesome back up vocals along with the aforementioned lyrics make this a standout track on the album, definitely the catchiest one by far in my opinion. We finish off this medley with another great guitar solo, hit the chorus and we are out. And we come back in with the adventurous tones of one Rygar Medley. We kick off with some soaring instrumentation and down to earth sounding drums. This introduction dies down and comes back up with the darker, braver, and just as adventurous sounds as before. This is definitely the perfect kind of track you set out and fight monsters with. And what a fight it must be because this seems to be the longest track on the 51 minute album. Within the allotted seven minutes the medley is heard traversing a lot of ground in the game and musically as well. When we kick into the half way point things come to a halt as we get some grunged out guitar that gets you pumped up for the remainder of our journey. But this excitement slowly fades into the toned down jazzy sounds that hit right after, as if you just came to a saddening realization about your journey. No time for that though, you got monsters to fight and people to save! So the sadness fades away and we are off again, up that mountain to a glorious final battle as the music swells and we hit the final stride of this epic medley. "We shall fight!" Here we are, at the end of our journey with the most trying test yet, do we reach victory or do we return home broken and shunned. The music swells and circles around this fight hits hard and... cuts off. We have to leave that adventure at the most inopportune time unfortunately. Why you ask? Because there is an alien invasion happening as we speak! So we assemble the Contra force and hit the alien lair hard, and what music is blaring? Why it's the Contra Alien Lair, and Base music of course. The song starts with a thumping bass line and busts into a rightfully metal rendition. This builds and builds and is promptly cut off by the sudden insertion of some jazzy piano and guitar. But forget that, back we are with a fusion of the two styles. with the swirling keyboard creating a slightly alien tinge to the overall tone of the song. The song builds up again in the last minute to lead into the pseudo 3D mayhem of the Base theme. the thumping bass line returns and we are lead seamlessly into the toe tapping beats of another classic. Yep, we are now in the upbeat egg plant territory of a Kid Icarus Medley. The opening definitely gives you a sky high up in the clouds feel to the proceedings. The guitar brings in an adventurous tone to the mix as well. With a screaming solo near the center. The song seems to continuously switch off between a dark cave like adventure and the wide open expanses of the sky. It makes for a great juxtaposition of sounds that is great to listen to but tough to describe. The song finally chooses sides and comes to a close with the tone of upbeat success. This is where we kick into Mega Man again. This time with Mega Man 2 - Crash Man. A laid back somber mood starts off this track. As if more of a reflection on Crash Man rather than an impending fight with him. This shifts into one hell of a danceable beat though. With a pulsing rhythm and catchy musicianship this is a kind of Crash Man you have not heard before. This leads us into one amazing and catchy bass solo and some of the best vocal work ever. I don't even want to explain as this funky styling has to be heard to be enjoyed. This is another track that definitely stand out as a surprisingly clever and extremely catchy arrangement. From the robot fueled future we take a trip into the Transylvanian past with Castlevania 3 - Intro, Clock Tower. The tune starts off slow as if kicking off in a desolate and dreary rainstorm. The track gives off that feel of being in a creaky poorly lit mansion housing who knows what abominations. Who cares though, you find a nice piano in one room and you'll be damned if any monsters are going to keep you from having a good time! What I mean is that the foreboding track gives way to some swinging piano which itself drops away for an exchange of epic metal riffage. As if Death himself challenged you to a duel, and you have been looking for trouble all night. This leads to another foreboding piece as if ascending the final stairs before facing the master of the mansion himself, but as with our adventure in Rygar we are cut off a little too soon. But hell, maybe we don't even have to fight Dracula, maybe all we need to do is make a simple phone call to some folks well versed in handling the supernatural. Some people that are not afraid of any ghosts. The Ghost Busters Bhost Gusters! Damn right! We kick into this extra metal version of the Ghost Busters theme with double drum pedals, blistering guitar solos and in your face vocals. We of course can't forget the driving bass and intense keyboard work. Backing cheers of "Ghost Busters" and the barbershop ending to the track all lend a lot to the mood of the song as well. Definitely a brilliant closer to the album, which sends us off on that same nostalgic beat we came in on. Oh, but wait, there is one more track, the Danimal created chiptune Black Hole Enlightenment. A vibrant six and a half minute journey through the musician that is Danimal Cannon. It starts off simple enough creating a space like atmosphere which turns into some rough low ends as if journeying into the dank caverns of an alien planet. The song doesn't stay in one place for long, as it seems you have made the most of your situation. Finding some handy weapons, you set off to explore the strange terrain. You start your slow, ominous trek along the alien surface. You befriend the locals, learn of this worlds ancient past, and at the same time your own future. You reflect upon why it is you ended up on this planet and how it may not have been such an accident after all. You have to focus on the task at hand though, traversing enemy terrain, taking down monsters and bosses in your harrowing adventure across the planet. Taking you through ruins, forests, deserts, and even the requisite ice level. We are now five minutes into the song and what was that? Did I beat the final boss, saving the planet and becoming the hero of an entire world? Well it's the credits music so it sure seems like it! You return to the adulation of the crowds as the credits scroll past. You input your initials into the high score screen, and what is that? A second mission!? Oh, never mind, I have the album on repeat. That final track brings this incredible album to a close. Much like my review of the Armcannon debut album Leg Vacuum it is tough to nail down just what makes this band and this album so amazing. I can only hope I did them some justice in my assessment of the album and of course convinced you to investigate it for yourself. Head over to armcannon.com right now and drop some dough for this incredible album. You will not be disappointed in the least. Even if you are unfamiliar with the tracks they recreate here, the music is so well done and enduring that you will be more than happy to enjoy them devoid of even the nostalgia factor. The music here doesn't need that factor to be listened to, enjoyed, and appreciated. The talent on display here is all you need to be honest.